Breakage raises the bar for live drum machine programming and performance. 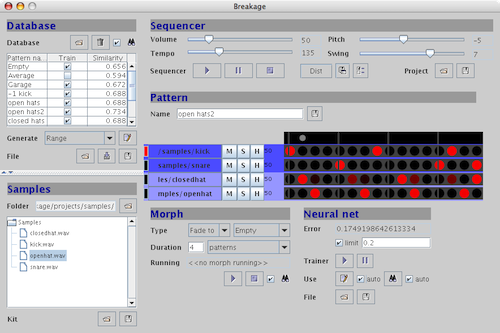 Where traditional step sequencers edit one note at time, Breakage adds neural network and pattern morphing functions to allow composition above the note level. Patterns are written in a step sequencer grid and a neural network is used to learn relationships between drums. After training, the network can generate complementary parts to your live drum programming. You can now select the sample browser's root folder. The pattern editor can display circles, squares or rectangles. A collection of bossa nova patterns is now included. There are now command line options to reset settings to defaults and run in a debug mode.